Oh my gosh did you just see that! The volcano just erupted, the lava was slowly oozing out of it but that is still really hot and can do damage. There isn't just one way that lava comes out, and it doesn't only come out of one spot, but look on these next pages and you'll find out all about it. Volcanoes are a passage way from the underground to the surface. Here you will find many interesting facts and information that will BLOW you mind! You will learn the three different types of volcanoes, what they are made of and what comes out of them...… and much, much more! Fill your brain with these interesting facts and amaze your teacher of what you know. A volcano is a way to look into the earth, they are what makes new land forms and builds new crust to help our earth. Volcanoes can be found all over the earth. A shield volcano is made when lava spills and creates a dome shape, so it looks like a dome shaped mountain. This volcano has lava that comes out of it when it erupts, which would make the volcano bigger once the lava has hardened. Also it is 9000 meters tall! It also occurs on a transform boundary, and can be found in Hawaii. They are lower volcanoes and have a caldera that moves when the magma lowers and rises. 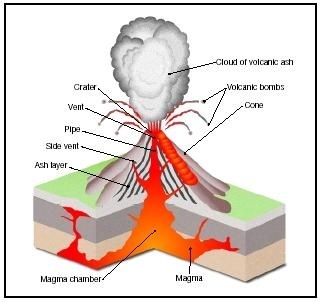 Another type of volcano is the Composite volcano. Composite volcanoes are some of the largest volcanoes in the world. It also has both magma and cinder that comes out of it when it erupts and it can have more than one vent. Also they are the most common volcano there is! 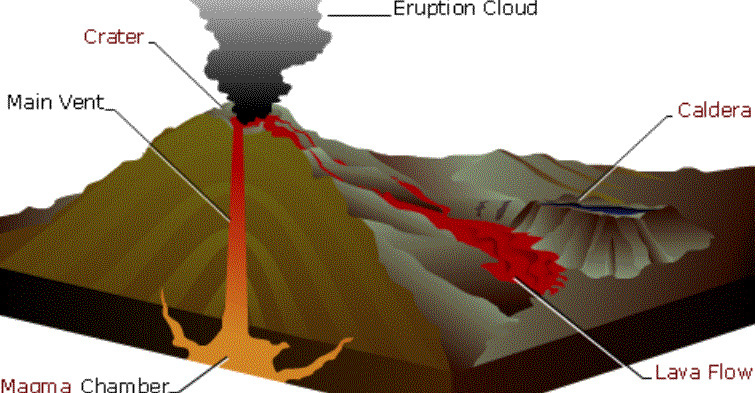 They can have gentle or violent eruption, and are located on a subduction zones. A cool fact about it is that it is symmetrical. It is from 100 to 3500 meters tall! 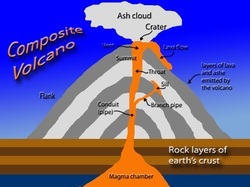 Composite volcano is made up of layers of ash, cinder and lava. Did you know that Mount. Saint Helen's is a composite volcano! 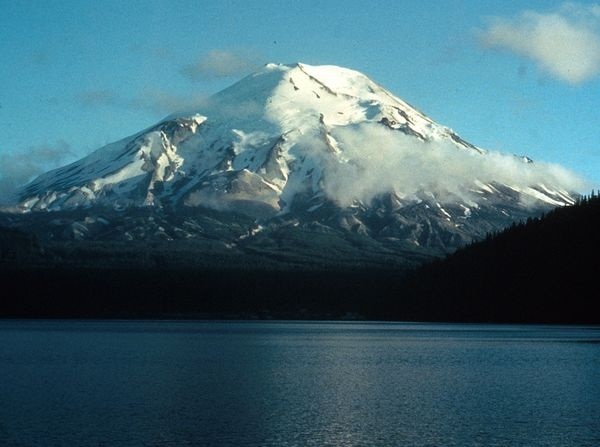 One of the three types of volcanoes is the cinder cone volcano. This volcaono spits out cinder ( tephra) and it is a very violent show. The cinder cone volcano is the simplest of all three but can cause the most damage. Cinder cone volcanoes look like cone-shaped mountains. They are from 100 to 400 meters tall. Cinder cone volcanoes can be found near other types of volcanoes, not just one of its kind. This volcano is made up of cooled magma, and is very steep. Cinder cones have one vent, so the cinder can only come out of one spot when it erupts. After the Cinder Cone volcano erupts it goes into dormant which is when it goes to sleep but can still erupt.